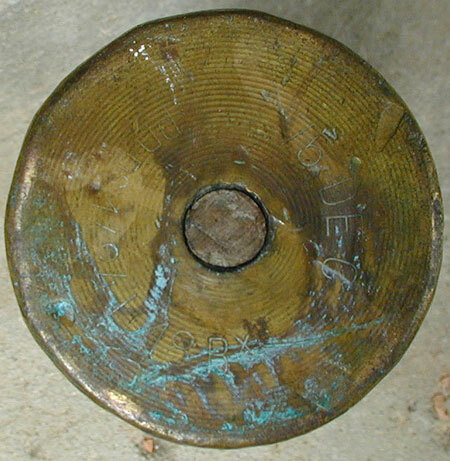 French Trench Art Vase made from an old artillery shell. Creating decorative objects from weapons of war as mementos or souvenirs is a practice that is probably as old as warfare itself. In recent years, this form of art has become highly collectible and is frequently called "Trench Art" because of the marvelous works created during WWI by soldiers passing long, fearful hours in the dangerous trenches along the front lines. Decorated brass shells or artillery cases (French: obus) such as those shown on these pages were a popular and plentiful base material used soldiers -both during the WWI and afterwards -- to create vases and othr objects. The Mementos often commemorate battles they fought in, remember fallen comrades, or celebrate the end of war and the arrival of peace. Many such pieces are done in a late art nouveau style. 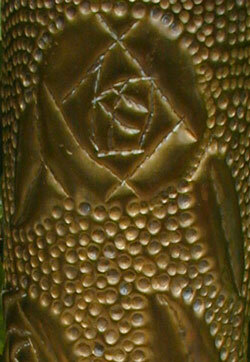 Repoussé - a method often used to create Trench Art vases -- is a technique of creating a design in relief by hammering or pushing the reverse side of a metal surface.